More than 210,000 veterans live in New York City, making it one of the largest veteran populations in the nation, more so than some entire states. 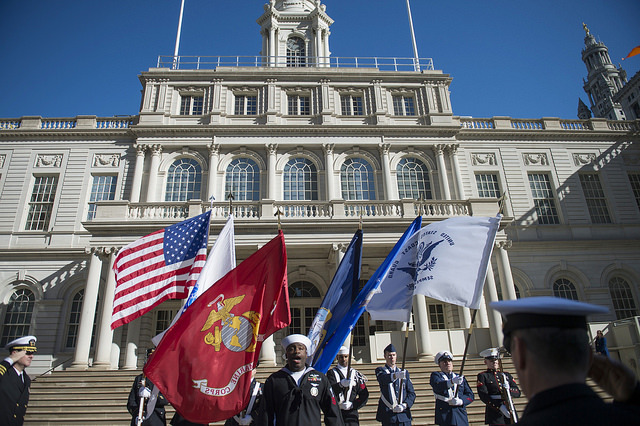 The administration of Mayor Bill de Blasio, a Democrat, has committed additional resources and funding to address veterans’ concerns and challenges. 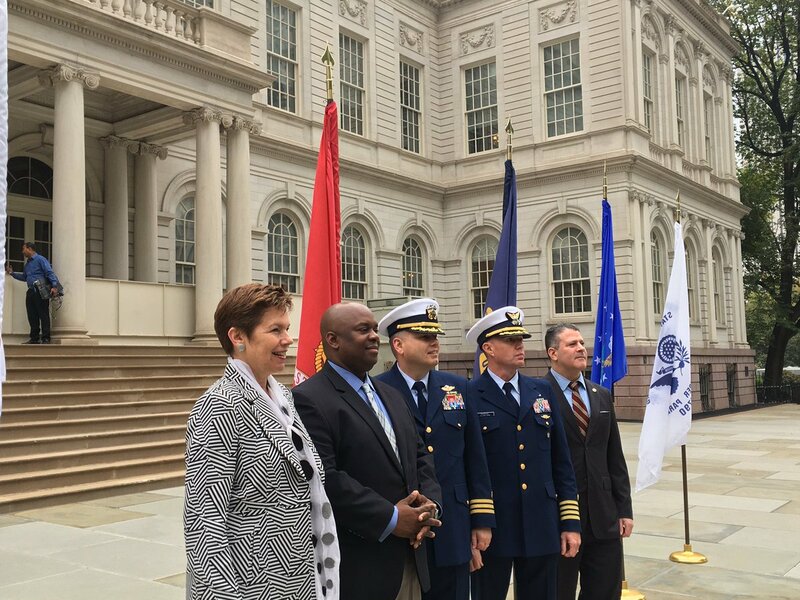 The City Council has been actively pursuing veteran-friendly policy, including the legislation that elevated the Mayor’s Office of Veteran Affairs into the new Department of Veterans’ Services (after initial objections from de Blasio). The Department of Veterans’ Services launched in April and has been operating with its expanded budget since the July start of the new fiscal year, boosting its staff and ramping up operations. The department is well on its way to full deployment in the next few months, said Commissioner Loree Sutton in an interview with Gotham Gazette at the agency’s main office at One Center Street, across from City Hall. Sutton laid out her priorities and the “non-negotiable core services” that the department is focused on: housing and support services, an integrative healthcare program, and the E3 initiative (education, employment and entrepreneurship). “For the first time, we’ll finally have the capacity to not only establish a citywide presence but be able to engage in these three lines of action,” she said. The department’s priorities align with what veteran advocates have long demanded, and they praise Sutton’s leadership for it. Recognizing that the department is young, advocates do say they would like to see a clear articulation of those priorities through outreach to the veteran community. “It takes time to build out so of course some of the veterans in the outer boroughs are wondering, ‘Where is it?’, but it’s growing,” said Joe Bello, a Navy veteran and member of the city’s Veterans Advisory Board, shortly after a recent hearing of the City Council’s Committee on Veterans. “There needs to be something about what the city is actually offering vets,” he added, saying the department should consider creating a resource guide to its services in order to reach out to veterans and their families. Rouse acknowledges, as a former city employee, that government can work slowly, but she’s encouraged by the staff the Sutton has hired, many of whom are veterans themselves. “It’s going to take some weeks and months for them to really gel as a team and to craft a plan that says, ‘Here’s what we’re doing,’” Rouse said. She stressed that the department should not lose focus, however, of issues that go ignored, like affordable housing for student veterans and discrimination faced by veterans. After the October 28 City Council veterans committee hearing, Council Member Eric Ulrich, a Queens Republican who chairs the committee, told Gotham Gazette he was optimistic about the new department’s execution, but hasn’t yet seen a long-term plan for veterans from the de Blasio administration. “I don’t think it’s even on their radar right now,” he said. He did praise the city for ending chronic veteran homelessness and emphasized the need for connecting veterans with permanent affordable housing. But Ulrich said one area where the city is failing is in providing adequate employment for veterans, “and good paying jobs, not low paying menial jobs, but jobs that reflect their skills and abilities and their talents and the things that they’ve learned in the military,” he said.